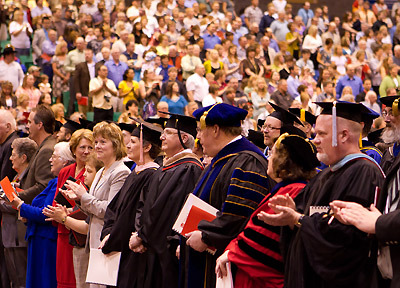 Minot State University will celebrate the graduation of our students at the annual Commencement Ceremony on Friday, May 10 in the MSU Dome. The ceremony will begin at 10:00 A.M. with faculty leading the graduation candidates into the Dome. I encourage all faculty to show their support of our students by participating in the procession. If you need to order regalia please contact the MSU Bookstore. The Bookstore would like to receive all orders for regalia no later than March 29. Your adherence to this deadline will be most appreciated. I look forward to a fine ceremony and celebration of our students' achievements.